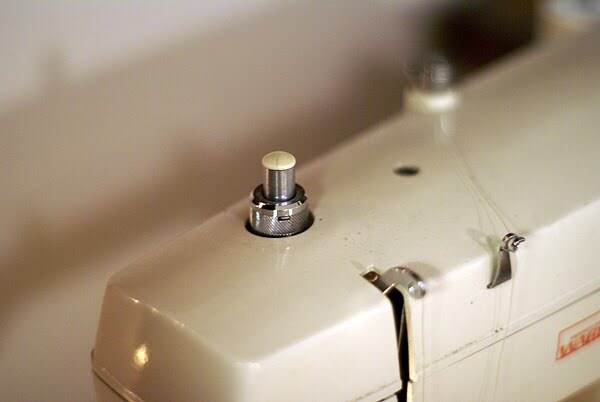 I was asked the other day about my sewing machine. It was made by Montgomery Ward (remember them?) and is almost as old as I am. It’s the machine on which my mom taught me when I was a teenager. I should say she tried to teach me. I wasn’t a very longsuffering student, though I did manage to crank out a couple pair of bermuda shorts (remember those?) and a dress that I submitted in the sewing contest of our local Junior Miss program. 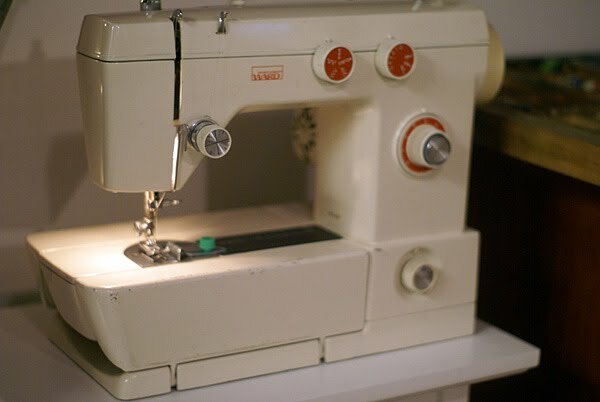 But though my own skills were lacking, I remember watching in amazement as my mom sewed on the machine, the fabric flowing under the presser foot and through her fingers like water. She’s a fantastic seamstress. While I have to push myself to sew something with only straight seams, she’s made a little bit of everything, including three wedding dresses. My mom gave me her machine when she bought a new one a few years back. It sat in the box for several years, brought out only for occasional use. 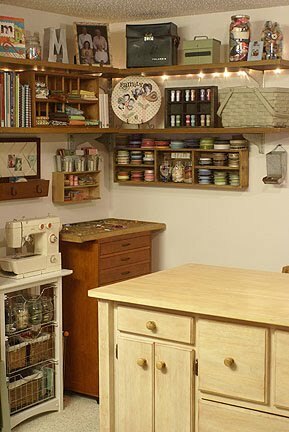 When we bought our first house and I had a craft room, I found a spot for it. It was still used infrequently, except to sew on layouts. It went back in the box when more babies joined our family and settled in that room. The machine found its way back out in the open in our new home. I plan on cleaning and oiling it, which I have never done (*blush*). Who knows what might happen after that. I know its functions are very basic, but it’s a workhorse. And truthfully, I don’t think I could ever get rid of it. 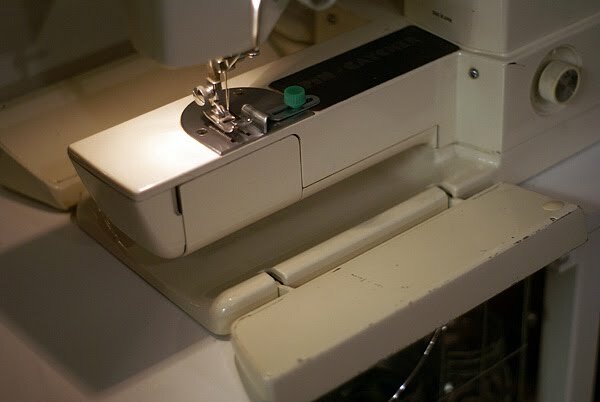 When I press my foot on the treadle, I’m taken back to childhood by the familiar sound of the machine’s motor as the needle moves up and down. It’s comforting. And I’m sure no other machine would sound quite the same. What about you? Do you own something that could probably use an update, yet you can’t bring yourself to part with it because of the feelings it invokes? On another note, I’m in the middle of a really fun project (well, two projects–same type of item, totally different styles) that I’m very excited to share. Stay tuned! Yup, keep that old machine – a problem free machine is worth it's weight in gold. I don't sew AT ALL. :) But I do remember Montgomery Wards! 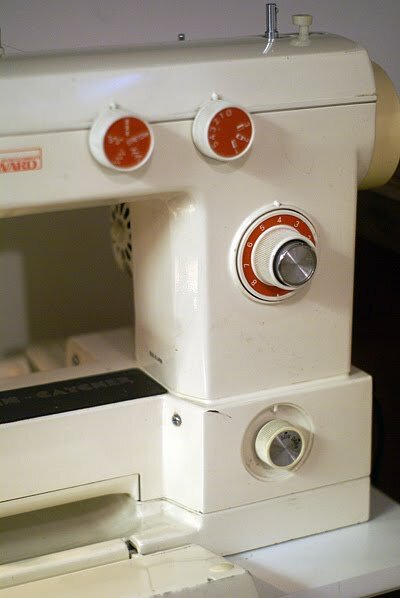 I too have a sewing machine that transports me back to years gone by-actually I have two- the first machine is a straight sewer only and was given to me by my grandmother when I was about 15 years old-much to my mums delight because it stopped me from using hers- I sewed many an outfit on that-including my wedding dress-I even repaired buckles on sandals when they came off-it is so heavy duty but I love it and would never part with it -the other is one my mum helped me buy when I was newly married-it's pretty basic too but served me well when I needed to make clothes for our growing family – I am about to purchase another machine but will be keeping both of these as well because of the sentiment involved- the new one will be to make clothes for my ever growing number of grandchildren and will be paid for by a small inheritance from my mum so it too will be special – I will leave them to my grandchildren and hope they will appreciate them as much as I do. I have a piano in my livingroom that I took lessons on as a child -however I do not play now as an adult, and no one else does in our household! However it holds sentimental value~don't know what to do with the space hog, I am torn!! I wish I sewed but I don't. My two daughters do, does that count? In fact, my oldest girl made my husband and I the cutest valentine! She stitched a plain piece of off white fabric to make it look just like lined paper (blue lines horizontally and a red line vertically on the left side) and then stitched "I love (heart shape) you!" on it. Sweet. I love your work space. It's organized and so welcoming! Very good point about the problem-free part! I would be torn, too, so I'm no help! At least it can serve as a shelf for pictures or other decor! WOW!!! I could have typed this up w/a few alterations! my grandma tried to teach me & I just inherited my great grandma's Montgomery Ward machine. I am working @ getting brave enough to play w/it but am equally terrified as excited!